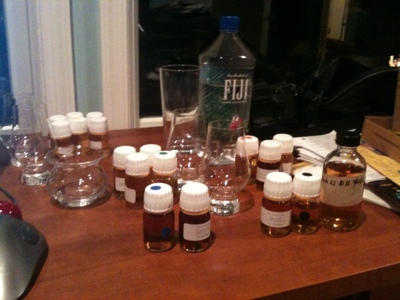 "Another observation I made was that some of the tasters worked with regions in mind when guessing the distilleries. “Classic Speyside, coastal, Highland, Campbeltown”. More often than not, these conclusions turned out to be wrong. It really is time to say goodbye to this outdated regions concept for anything beyond mere grouping purposes." I am completely guilty of that, as is clear when you look at my notes. 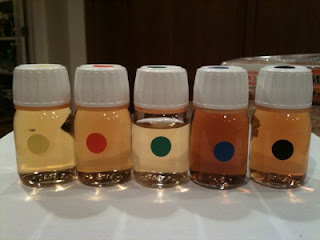 Here, for anyone's interest, are my final tasting notes and guesses as submitted - and the actual results. Some mammoth tasting sessions ensued. Nose: green pear, green apple, banana, green melon, butter, mineral, honey, honeysuckle - with a potent estery solvent phenol aspect that amps up the mineral note. Entry is semi-sweet with Lychee, grapefruit, and a gentle expansion of peppery heat. 45%-46% alcohol. Finish is gentle with echoes of waxy tropical fruit and some estery solvent / polish notes. Ben Nevis 1974/2000 56.4% – green pear, melon and butter and honey – but no honeysuckle and less mineral - and too strong. Glen Elgin 1975/2011 46.8% – pinepple, green melon, banana, butter and mineral, but missing the green apple and honeysuckle – but very close. Dailuaine 39 1971/2010 46.6% – green apple, green melon, butter, mineral, and honeysuckle, and also a hint of ham meaty quality very very very close On the tongue there is the some grapefruit and much the same gentle expansion of peppery heat, waxy tropical fruit and estery solvent. But there are differences too. More malty and meaty notes and sometimes a tiny whiff of smoke. But, wait, the Glen Elgin 1975 in my glass is a bit more honeyed, and a bit less mineral. Mineral - that sounds like Glenfiddich. Vs. Glenfiddich 15 Solera 40%: similar green pear, green apple, honey and honeysuckle and mineral, but more mellow and less phenolic and dynamic. Tasting the Yellow one, the Glenfiddich 15 Solera, the Glen Elgin 1975/2011 Malts of Scotland "Angel's Choice", and the Dailuaine 1971/2010 Perfect Dram head to head is a dizzying experience. They are all so close. Green pear, honeydew melon, butter, honeysuckle and some mineral in each and every one. Significantly the Yellow is more vivid and brighter, honeyed, and phenolic than any of the others; the clear winner in the group. The nose is a bit bigger than the palate, but what a nose! There is less oak than the Dailuaine 39 or the Glen Elgin 35, but not by much. There's less pepper on the expansion, but more melon and lychee. Delicious. The Glenfiddich at 40% is noticeably weaker than the others, but there are other Glenfiddich expressions such as the 18 year excellence with higher proof and similar flavor profiles. I'm agonized I can't pinpoint the distillery - but the flavor profiles are all within a hair's breadth. This was listed as my second favorite of the tasting. What a delicious dram! Nose: Iodine, sherry, green apple esters, toffee, some spices like curry, fenugreek. A slight meaty note. Fairly dry overall. 43%-46% alcohol – first guess. Entry is richly sherried, complex, sweet. Figs and black cherry, with old oak leather and tobacco. Midpalate expansion is bold – maybe 50% or above, or maybe just 46%. Nice oak influence. Clearly a sherry aged or finished malt. Mix of spice and sherry immediately makes me think of Glendronach. Too dry for a PX – this is olorosso. The finish is oak, leather, cocoa, and hatbox woods like bass wood. My least favorite of the tasting, but still lovely. 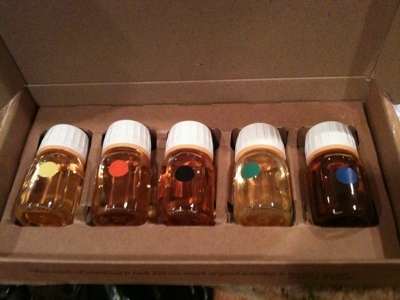 Nose: Iodine, curry, rancio, spice, green apple, melon, honeysuckle. Oh my my. This is a sherry cask aged or finished version of a Scottish highland with some maritime influence, but also some speyside-like fruit basket aromas. A big complex and rich nose. Me likey. Taste: Huge opening with figs, plums, demerara sugars peppery expansion yields some leather and balsamic notes. 56%+ cask strength. I'm getting Glendronach again in a big way, but the Spey-like fruits and curry flavors are also bringing to mind Clynelish: elegant fruity melon, pear, furniture polish esters. Glendronach 18-22 years old cask strength – call it 55%. Final guess: Glendronach OB 20 yrs 1990 57.9%. My favorite of the tasting. A superb sherry bomb. Nose: Phenol then earthy peat w/sweetness: toffee, melon. The peat abates soon, leaving green pear, honeysuckle, honey and a hint of sherry, mint, and the sweetness mixing with the smoke: bacon. On the tongue: Sweetness, grassy honeysuckle, phenol (polish), marshmallows. There is a kiss of mint, but more fruit basket ester flavors of honeydew melon, green pear and apple. Good heat - high abv 50-52% moderately short finish leaves malt and hint of vegetal flavor (asparagus or spinach). This is big richly flavored lightly peated Spey. It's noble and probably old (ha ha - my final guess is less than 10 years old!). Peated Spey? Higher proof? How about BALLANTRUAN Peated 50% from Tomintoul? Other candidates? Benromach Peat Smoke 46% (possible) - too smoky, Balvenie 17 Peated, Caperdonich young peated from Jean Boyer. Benromach Cask Strength 2001 OB 59.9% - final guess. Listed as my second to last favorite, but I loved it and would drink it any time. It's near five star territory. Nose: Phenol sherry or port vinous aromas, plus iodine, slight curry, and a savory or meaty note. Some sandalwood too. There is putty, clay, and mineral notes. Further nosing reveals orchid notes. Dusty. A tiny bit of sulphur. Possibly quite old. 46%-50% Candy sweet entry. A floral burst (roses) and spicy midpalate with red fruits (raspberry / strawberry) melon, apple, nougat sugars mixed with oak and hatbox wood. There's a big drying finish with plenty of oak tannins Glendronach again? Could be a trick. Maybe a port finish? BenRiach? Some tawny port finish BenRiachs or sherry finish BenRiach's of the mid-70s or early 80s? But not peated. 1992 cask 972, aged 19yo, Tawny Port Hogshead / Tawny Port Finish 55.6% - a bit too strong. I'll say BenRiach 1975 cask 4450 aged 33YO, Peated Tawny Port Finish 52.2% - final answer. Boy - I got THAT one totally wrong! My third favorite of the tasting - a superb dram. Bottom line - what a great time. I'm glad I won but I didn't win any real crowing rights. I remain humbled and anxious to learn more. One thing I do know for sure, opening a package like the one below is an exciting pleasure. Macdeffe, I'm honored you stopped by. Your blog is amazing. Humble pie is annoying - but the fact is that if even a single person got a single identification right they would have easily beaten me. That no one did sure feels like luck to me.